There are not millions of Palestinians refugees. There are not hundreds of thousands of Palestinian refugees. There are, according to credible estimates, roughly 30,000 Palestinians still alive out of the original refugee population of 750,000 or so from the 1948 war. By contrast, there are over 16 million non-Palestinian refugees in the world. Keep this in mind when reading the following letter published in the Guardian on Feb. 8th. Anish Kapoor accepts Israel’s $1m Genesis prize and makes a heartfelt statement about the plight of refugees – but fails to mention the word “Palestinian” (Kapoor uses prize to protest at ‘exclusionist’ refugee policies, 6 February). Predictably, his words have been packaged by the prize organisers (co-sponsored by the office of the Israeli prime minister) for a global audience, and they have provided Israel with a $1m PR victory. It’s laudable that Kapoor wishes to give the prize money to refugee support. But given that Palestinians form one of the largest and most longstanding refugee populations on the planet, and given that the Genesis prize rewards “commitment to the state of Israel”, it’s perhaps unsurprising that Kapoor’s call for empathy for refugees has been used to improve Israel’s poor image abroad and promote empathy for Israel at the expense of its victims. For as long as artists like Kapoor continue to accept these obscenely large gifts, they gift Israel the social licence to pursue its ongoing dispossession of Palestinians. Let’s leave aside the suggestion that accepting an award “recognizing individuals who have attained excellence…and who inspire others through their…dedication to the Jewish community and/or the State of Israel” is a morally reprehensible decision, and focus instead on the sentence we’ve highlighted. 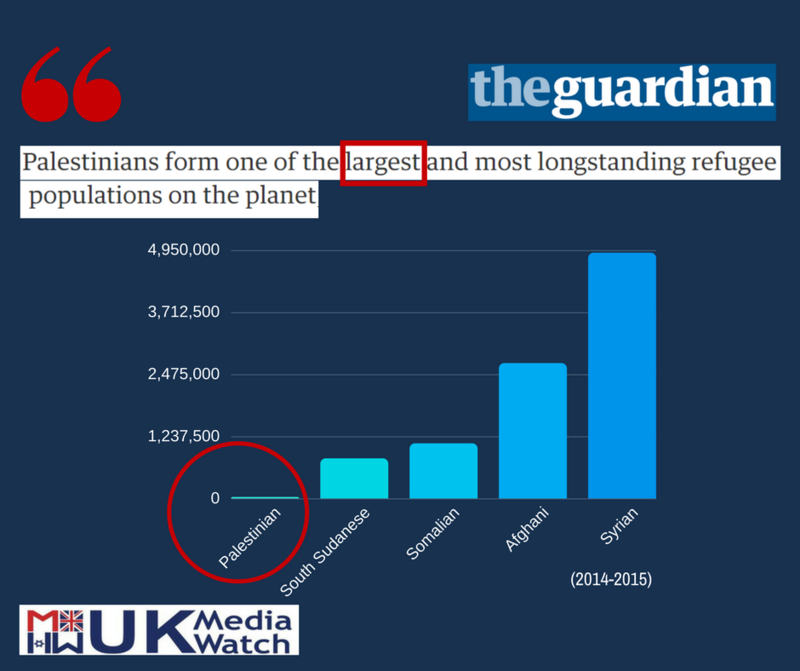 As we’ve demonstrated, Palestinians are not in fact “one of the largest” refugee populations on the planet”. The only reason why many could be forgiven for not understanding this has to do with the fact that – unlike the way all other refugees in the world are treated – UNRWA (the UN agency which deals only with Palestinians) defines as a “refugee” all subsequent descendants of those 750,000 actual refugees from ’48. But, regardless of how UNRWA defines it, nobody can conceivably claim that these millions of descendants are actual refugees. Indeed, if UNRWA’s definition was applied to the 800,000 or so Jewish refugees from Arab lands between 1945 and 1967, it would make millions of Israeli Jews (who are descendants of the 800,000) eligible for refugee status. Most of the world’s actual refugees today are from three war-torn countries – Syria (4.9 million), Afghanistan (2.7 million) and Somalia (1.1 million). Perhaps the reason why Anish Kapoor didn’t mention Palestine when he spoke out against “abhorrent government policies” towards refugees is because he understands intuitively that there are relatively few actual Palestinian refugees in the world. If, however, Kapoor did mention Palestine in the context of refugees, he would have needed to speak out against Arab governments which have refused to settle and grant full citizenship rights to millions of descendants of Palestinian refugees who live within their borders. Indeed, the biggest refugee “scandal” is the fact that such cynical Arab leaders (including the Palestinian Authority) prefer that Palestinians continue to remain stateless in order to use the evocative imagery of their suffering and deprivation as a political bludgeon in their cognitive war against Israel. Of course, it is no less a scandal that British media outlets consistently fail to critically examine this “refugee” deception which consigns generation after generation of Palestinians to a life of misery, squalor and hopelessness. Well, actually I am a genuine Jewish refugee. An ever-so-many-great-grandmother was kicked out of Granada in 1492 and the label “refugee” was then passed on from mother to daughter and so on till the 25th or so generation. I am glad to report that the Spanish government has finally conceded that us Jewish refugees have the right of return. About time too.